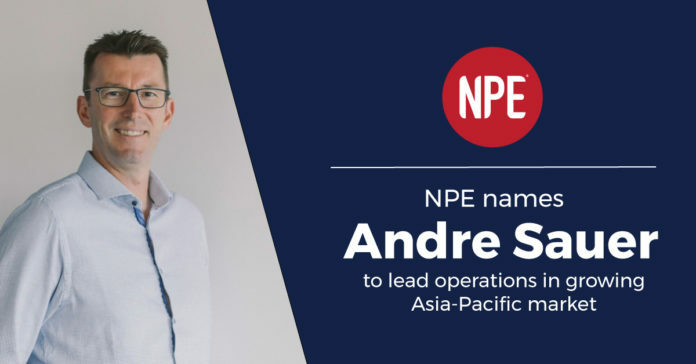 SYDNEY, Australia – Global fitness business coaching company NPE CEO Sean Greeley has appointed Andre Sauer as the Asia-Pacific Director, effective immediately. Sauer was formerly Co-Founder and Managing Director of NPE’s regional office in Asia-Pacific from 2007 through 2014, so his return to the helm comes as growth in the sector continues to increase. “We’re thrilled to bring Andre back as he has an outstanding record of business success across the Asia-Pacific region, including deep knowledge of Australia, New Zealand, and the South East Asian markets,” said Greeley. “Andre is an experienced leader and a great strategist. He understands professional business management and the nuances that help make all the differences for our clients. Andre knows how to help fitness business owners become not only more profitable, but help them find more time for themselves and their families…and that’s fundamentally what NPE and our growing family of clients consider real business success,” Greeley continued. Sauer is excited to be back working with professionals in the fitness industry. “Seeing our clients turn from struggling personal trainers to successful business owners, that make a difference in their local communities is what brought me back into the industry,” said Sauer. Sauer believes NPE offers a unique growth structure for both newly certified personal trainers and veteran fitness business owners. Sauer has an extensive executive background and track record throughout Asia-Pacific, including assisting startups in the technology industry, and serving as managing director in technology-driven companies in Malaysia. A native of Germany, Sauer studied and lived in China to work in international business before being recruited to work in Malaysia. He moved to Australia in 2007 to raise his family in his wife’s hometown of Perth, Australia. There, Sauer met fitness business owner Ric Isaac (now NPE Sales Manager) in a local Mastermind Group. The two founded Fit for Profit (FFP) in 2007, having licensed NPE’s programs, resources, and tools to assist the growing fitness industry in Australia. The organization grew quickly, NPE and FFP recognized the natural fit to bring FFP in-house under the NPE banner, and in 2013 NPE purchased FFP with Sauer remaining onboard. Sauer will work with NPE’s Asia-Pacific’s Coaching Manager, Tom Hart, currently headquartered in New Zealand. NPE is the leading fitness business coaching company for business owners to grow their business and create the life they want. Fitness business coaching includes one-to-one and group coaching, online education, tools and templates, technology, live events, and a supportive community that empowers business owners to grow. Since 2006, NPE Coaching has helped over 36,000+ fitness business owners in 96+ countries grow their business and create the life they want. It is an award winning global company with a team of over 50+ staff across three offices in Orlando, London, and Sydney.